In an effort to reduce our environmental impact and increase interactions between attendees, this year’s conference program will be fully digital! 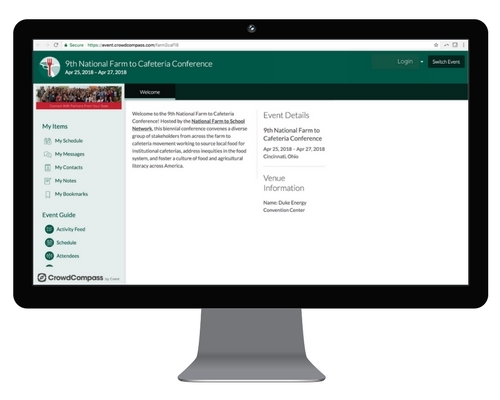 The conference app is the best way to stay organized during the conference, keep track of your schedule and workshop times, connect with other attendees, access resources and document, and more. The app can be downloaded to any mobile device (cell phone, tablet, etc. ), and is also accessible via your computer web browser. Everyone registered for the conference received an email with instructions for downloading the app. Additional instructions and getting started tips are listed below. Note: There will NOT be a printed program for all attendees at the 9th National Farm to Cafeteria Conference. The app is the best way to stay organized during the conference and keep track of your schedule. If you are not able to access the electronic conference guide during the conference or do not have a mobile device, we encourage you download and print the program guide and bring it with you to Cincinnati. There will be a limited number of printed conference schedules available for those who need them at Registration table. Share your feedback! Evaluation surveys for individual workshops, plenaries, short courses and field trips are located in the mobile app. To take a session survey, click on the SCHEDULE button, select the session you participated in, and click the “Take the survey for this session” link. PPT presentations and handouts shared in workshops and short courses are available for download in the mobile app. To find these resources, click on the SCHEDULE button, select the session you participated in, and scroll to the bottom to the DOCUMENTS section. Available materials will be linked here. If the materials you’re looking for are not linked, please contact the session presenters directly. 1. Find the page that has the PDF you’d like to download attached to it. Under the documents header, click the name of the PDF. 2. Tap the export icon in the top right corner of the screen to open an options menu. Tap Copy to iBooks to save the PDF on your device, tap Mail to share it in an email as an attachment, or tap Print to print the PDF to any printer on the same Wi-Fi network. 1. Find the page that has the PDF you’d like to download attached to it. Under the documents header, click the name of PDF. 2. Tap the three dots in the upper right hand corner to open a pop-up window. Using these buttons, you can either send the file with your chosen email client, open it with a program of your choice, download the file to your device, or print it using any printer on the same Wi-Fi network as you. 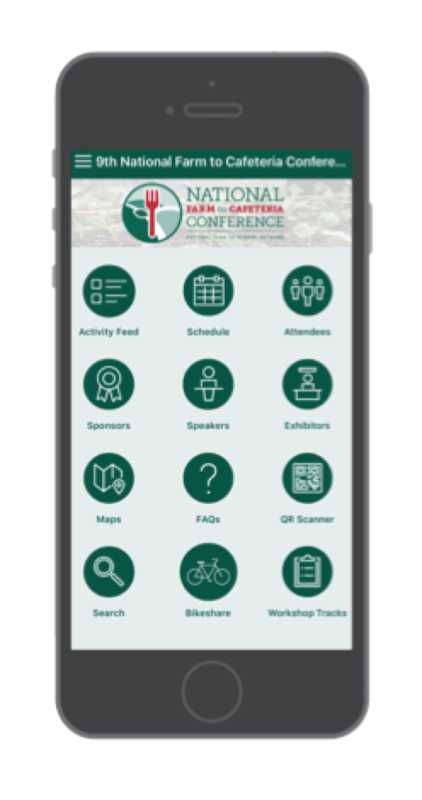 Everyone registered for the conference will receive an email with instructions for downloading the CrowdCompass AttendeeHub mobile app and logging into the 9th National Farm to Cafeteria Conference event. Additional instructions are included below. The event password is farm2caf18. WATCH a video on how to log into the app here. 1. On your mobile device, open the email invitation in your inbox. 2. Click Download the App. 3. Then, go back to the email invitations and click Verify Account to unlock the app and give you access to all of its features. 3. Login with your first and last name. 4. You’ll receive an email to verify your account. We just want to make sure it’s you! 5. Open your email to find your verification code. 6. Return to the web version of the app and enter the four-digit code to finish logging in. 1. Download the CrowdCompass AttendeeHub app on your mobile device. 2. From the event homescreen, tap the hamburger icon (three vertical lines) at the top left of the screen. 3. Tap Log in, and enter your first and last name. 5. You’ll receive an email to verify your account. We want to make sure it’s you! 1. From the app homescreen, tap the hamburger icon (three vertical lines) at the top left of the screen. 4. Tap Resend Code to have your verification code sent to your preferred email address. Having trouble accessing the app? Email us at conference@farmtoschool.org for support. We'll also have a team of mobile app trainers on-site in Cincinnati to help anyone who needs support downloading or using the mobile app. 1. From the event homescreen, tap the three lines at the top and then tap the gear icon at the top on iOS or the top-most down arrow on Android. 3. From here, you can include a photo of yourself, edit your profile information, add contact information, and link your accounts to social media platforms for easy posting from the app. Already see information filled in? This is info you submitted when you registered for the conference. Feel free to update it if something changed. Tap the Schedule icon to see the full event schedule with session times, descriptions, speakers, and room locations. Tap the plus sign (+) next to a session name to add it to your schedule to create a personalized agenda. Tap My Schedule from any view within the schedule to access your agenda for that day or see what you're up to tomorrow. You can also find your personalize schedule by clicking the hamburger icon (three vertical lines) and tapping My Schedule (under My Items). 1. After logging in, tap the hamburger icon, then your name at the top of the screen. 2. Review your Privacy Settings, and switch from Public to Private. With this setting enabled you'll have to approve another attendee's contact request before they can view your profile. 1. Tap the Attendees icon. 2. Click the Silhouette icon in the top right to see Attendee Options. Click Hide on Attendee List. Fellow attendees will no longer be able to find you on the list at all. Find more instructions and tutorials in the FAQ section of the app. Not seeing what you need? Email us at conference@farmtoschool.org for support. We'll also have a team of mobile app trainers on-site in Cincinnati to help anyone who needs support using the mobile app.